Eddie Lopez of Arvin High School was a shortstop, pitcher, and leader for the Bears in 2005. 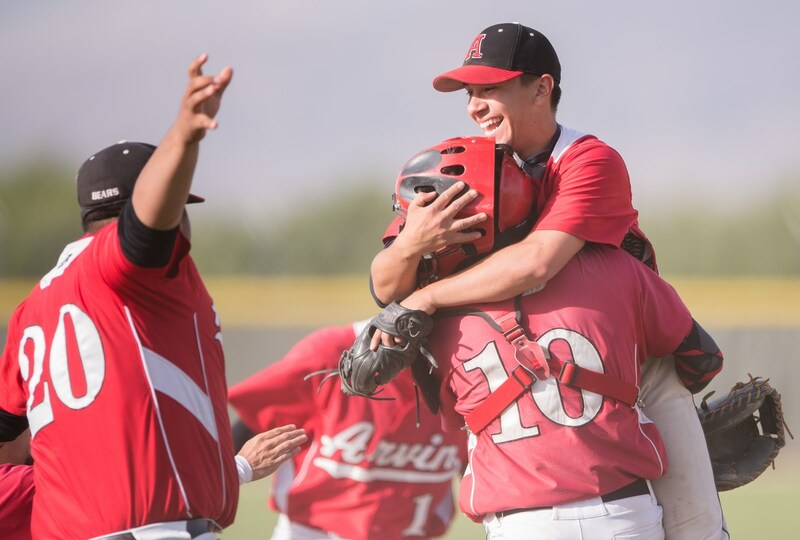 Under Coach Eddie Lopez, Arvin High School has turned into a winning baseball program. What has worked for Coach Lopez and the Arvin Bears? “The first thing we wanted to establish was that we are a winning program - no matter what has happened in the previous years with the win-loss record, or what other people think about the program, or how other teams might expect to have an easy win against us - we established the mindset that we are a winning program,” explains Lopez, “So getting that mentality that we were going to make teams grind out games against us and becoming a tough opponent was something we wanted to get done.” Also for Lopez, part of the process of winning is making sure that his team has fun playing the game of baseball. To establish a fun atmosphere, Lopez blasts Rush’s Tom Sawyer before games with a blend of latin music. Laughing and smiling illuminate the faces of the players in everything they do and small skills games are played amongst teammates showing a genuine admiration for each other. Perhaps most important (and most entertaining) is after the game, the coaches select a player of the game and that player gets the honor of wearing and or hoisting a WWE belt until a new winner is crowned after the next game. This ritual is celebrated by the whole team and the winning player is filled with authentic excitement as they hoist the belt into the air. At the end of each game at Arvin High School, the player of the game dons a WWE Championship Belt. In the first inning, things were a little shaky for the Bears. Starting pitcher Brandon Seablom was a little errant with his pitches as he seemed to be a little uncomfortable on the mound as he worked up his pitch count for the first few hitters. In the first inning Seablom walked Adrian Gonzalez after a lengthy at bat to Edwin Solis which resulted in a fly out to center field. However, Seablom responded with two quick outs to end the inning. In the second inning, Seablom also seemed to be uncomfortable as he managed to shut down the first batter of the inning, but hit the second batter. “I was a little uncomfortable to start the game, but I managed to find a rhythm after I hit Isaac Nunez,” recalls Seablom. 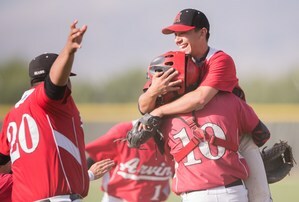 Teammates rush in to celebrate with Brandon Seablom of Arvin High School after he threw a NO HITTER. Robert Mendoza of Arvin High School went 3-3 with a HR, 2 Doubles, 2 Runs, and 1 RBI. If you remember, in 2005 Coach Josh Witcher called it a year to remember because of Eddie. In 2018, it is also year to remember for the Arvin High Bears because of Eddie and WWE championship belts. The Bears are longer the Bad News Bears, but they are Great News Bears. The Great News Bears are having fun this season as they are now 22-5 with a 10-2 record in the SSL.